Take a breath….and thank the trees. Now take another breath…..but this time thank the ocean. Yes, the ocean. It has been estimated that 50% of the global oxygen supply comes from the ocean. How does the ocean do this? 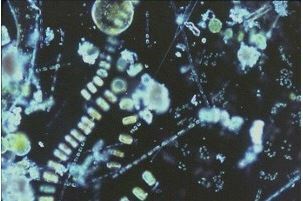 By providing a home to plant-like organisms called phytoplankton. Similar to trees, phytoplankton utilize the chemical process of photosynthesis. They use the energy of the sun with carbon dioxide to create sugars and in the process release oxygen as a by-product. However, while there are 3 trillion trees on earth, there is even more phytoplankton. A single teaspoon of seawater can contain as many as 1 million phytoplankton!